SuperFogeys - 221 – And By Books Do You Mean Skin Rags? Thanks go out to Erin Heasley, Mike DeVito and Tom Racine for their help on this strip. Did a pretty big update of the “Characters” page yesterday. Added some new characters, mostly from the Tangerine origin (currently running in SuperFogeys Origiins) and from Chapter 7. Did some minor updates on some old characters as well. I’ve been told even longtime readers enjoy reading the “Characters” page, so give it a click and check it out. I dare you to find a more comprehensive character list in all of webcomicdom. Now, near as I can tell, these sketches were done just before Tangerine’s first appearance in Chapter 5. Up until then, I’d only done 2 drawings of Tangerine, one that was the first sketch I sent off to artists who were drawing Untold Tales of the SuperFogeys (the bonus stories in the print books) involving him, and again for the cover of the first SF Collection. Those drawings were done at a time when my art style for SF was still pretty primitive, so I thought I’d better do a quick redesign before dropping him into the story proper. You can see I started one version of his head that I abandoned–probably because it looked too much like those first drawings. On the second attempt, I nailed it–thus the “Yes” written above. 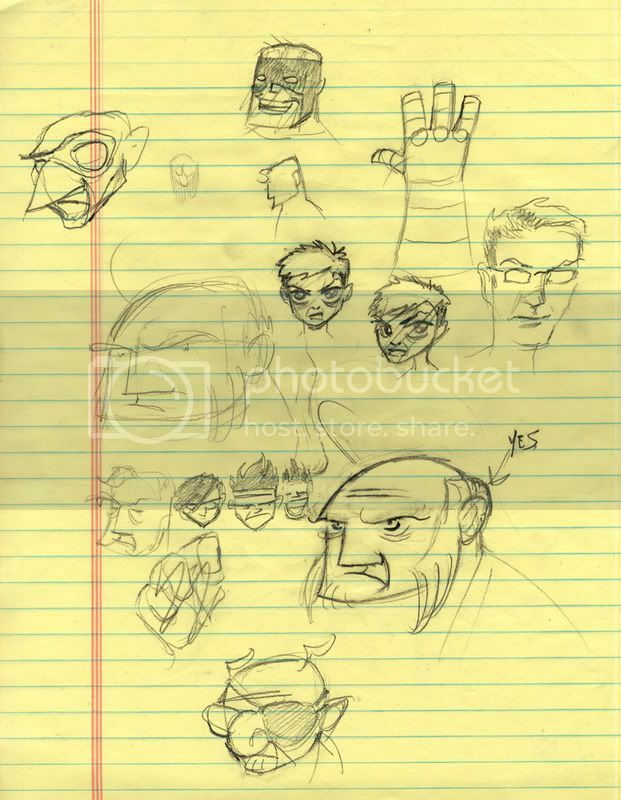 Other drawings on the page are a diseased self-portrait, simple shot of Tangerine’s hand, a couple bad Captain Spectaculars, a horrible-looking Dr. Rocket and a decent Jerry. It also looks like I might’ve been experimenting with future or alternate looks for Spy Gal and Swifty. No guarantee I’ll follow through on those. Most interesting, I think, are the three little heads drawn next to the good Tangerine head–Captain Emo, The Healer and Mega Matt. Tangerine’s origing wraps up in style when Eldon Cowgur bids SuperFogeys Origins goodbye on Tuesday. On Thursday, we check back in on Dr. Klein for a surprise. Don’t forget to order your copy of SuperFogeys Vol.1 today! Available in both Artist and Regular editions! Collects Chapters 1-5, FIVE Untold Tales of the SuperFogeys, commentaries, never-before-seen art, and much, much more. Get The SuperFogeys off the screen and into your hands where it belongs! Also, SuperFogeys Chapter 2 now available in the iTunes App Store!